Talk Abstracts for Metaphysics of Quantity Conference!! Countdown to Metaphysics of Quantity Conference: 0 Days 20 Hours 35 Minutes!!! UPDATE: The Conference Program here has a more up-to-date list of titles! 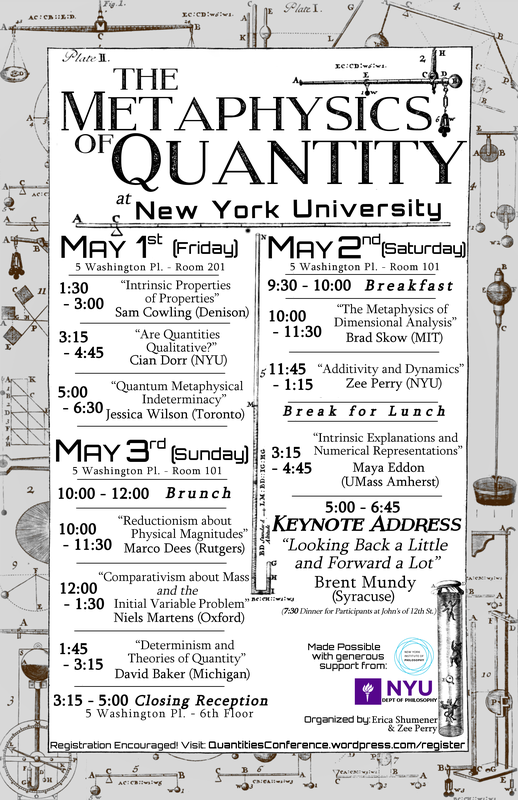 Countdown: 1 Month 0 Days until the Metaphysics of Quantity Conference at NYU! We are pleased to announce that we have selected four papers, submitted earlier this year, for presentation at the Metaphysics of Quantity Conference at NYU (Sponsored by the New York Institute of Philosophy), this May 1st through the 3rd. There were many submissions of extremely high quality, and it was very difficult to narrow it down to four. The papers submitted covered a range of topics, engaging with many different aspects of the metaphysics of quantity, quantitative properties, physical magnitudes. The organizers would like to thank all those who responded to the call for papers. Deadline for Submission EXTENDED! New deadline Feb 15! We are pleased to announce that the deadline for submission to the Metaphysics of Quantity Conference this Spring at NYU (sponsored by the New York Institute of Philosophy) has been extended to February 15th. Please see our Call For Papers for more details on how to submit! 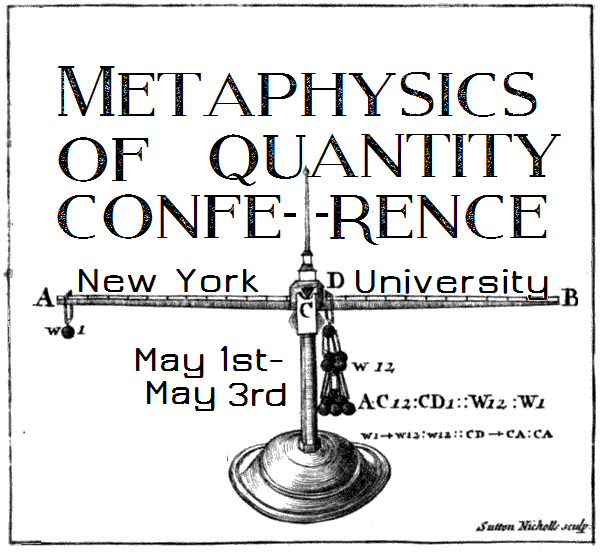 We are please to announce that we are now accepting submissions for a conference on the Metaphysics of Quantity at NYU, May 1-3. This conference is made possible thanks to generous support by the New York Institute of Philosophy. Description: This conference aims to showcase new work on the nature of quantitative properties and relations. By quantities we mean to include physical magnitudes—like mass, electric charge, or velocity—as well as other gradable features—like spicyness, population density, temperature, value. Quantities are often thought to exhibit a determinable/determinate structure. For instance, mass is an example of a determinable quantity while 5kg mass is an example of a determinate quantity. The metaphysics of quantity concerns the nature of these features. Questions in the metaphysics of quantity include: how are quantities related to numbers? Are some physical quantities intrinsic to objects? What role do quantitative features play in laws of nature? In virtue of what do a quantity’s determinates exhibit metric structure, etc? Quantities and their role in scientific and/or mathematical explanations. The intrinsicality/extrinsicality of quantitative properties. The relationship between quantities and naturalness, fundamentality, and/or grounding. The nature of quantities commonly represented with vectors, like velocity, force, strength, etc. The determinable/determinate structure of quantitative properties and relations. Papers should be suitable for a 45 minute presentation. The ideal length is around 5,000-6,000 words. Please submit a fully anonymized copy of your paper to themetaphysicsofquantity@gmail.com in pdf, rtf or docx format. Please also attach a separate document including your name, title of your paper, contact information, and institutional affiliation (if any). The deadline for submissions is February 1st.